Medication adherence is a growing issue around the world. Among patients in developed countries with chronic illnesses, approximately 50% do not take medications as prescribed. Improving medication adherence would not only improve patient outcomes but also decrease healthcare costs. The World Health Organization reports that “increasing the effectiveness of adherence interventions might have a far greater impact on the health of the population than any improvement in specific medical treatment." There is no silver bullet solution to the complex issue of medication adherence. But interesting approaches and tools that can help tackle various aspects of this issue are being developed — from simplified medication management to smart pill bottles. We were intrigued by the problem and wanted to explore new ways that technology could help patients adhere to their treatment programs. 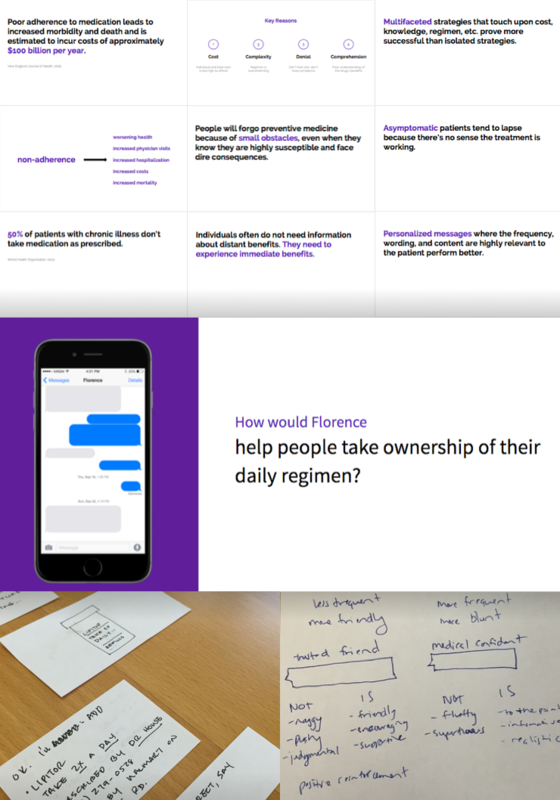 Our exploration led to the concept of Florence — a friendly chatbot that uses SMS to help patients understand and manage their medications. This exploration began with research. Before we could start exploring solutions, we needed to gain a better understanding of the issue. We read reports and journal articles to learn more about the underlying reasons for non-adherence. We spoke with patients and healthcare professionals to understand the issue from various perspectives. We also looked at the different solutions that are evolving in this space, as well as in other verticals. Our research led us to explore the use of SMS as one potential way to help patients adhere to their treatments by introducing awareness, guidance, and accountability into their routine. We were drawn to SMS in particular because it has the potential to reach a larger, more diverse audience and ultimately, help more people. We compiled this background information and shared it with a broader group of folks at Viget so they could learn more about this issue before participating in a design studio. During the design studio, we worked through several prompts to explore this concept further. The design studio allowed us to further define how SMS could be used to improve medication adherence. We wanted to share our findings with others — and gain feedback — so we documented what we learned throughout the process and how Florence might work. You can learn more about Florence at medicine.viget.com. Florence offers one potential technical solution to increase medication adherence. We hope that technology and design will continue to contribute to solutions that improve outcomes, decrease costs, and make patients' lives a bit easier. We recognize the complexity of this issue, however, and understand that in order to truly tackle this problem, solutions must also address socio-economic, education, healthcare access, and treatment model factors.